Building A Better Resveratrol: Is It Time To Switch From Resveratrol To Pterostilbene? Say again? Pterostilbene? (pronounced “tero-STILL-bean”) If you take resveratrol pills you probably have never heard of pterostilbene, but it is a naturally-occurring, molecular look-alike of resveratrol. Pterostilbene is alleged to be superior to resveratrol and the commercial availability of a pure form of pterostilbene (pTeroPure) is creating some manufacturer-driven hype that consumers should opt for it over resveratrol. The actual development of pterostilbene as a raw material for dietary supplements began with research conducted by US Department of Agriculture scientists. Pterostilbene is derived from blueberries. It’s being imported from India as a nearly pure extract. As we are all learning about resveratrol, higher dosage may not be optimal. Lower, not higher-dose resveratrol has been found to exert biological action similar to a calorie restricted diet, and lower, not higher doses protect the heart. So there may be diminishing returns in any attempt to build a more potent form of resveratrol. The impetus to bring pterostilbene to the nutriceutical marketplace is based upon some widely disseminated misconceptions — that resveratrol is not readily absorbed and very little of it is biologically available (bioavailable) for use by the body. Pterostilbene advocates claim resveratrol is poorly absorbed, but the research they cite in that regard says otherwise. Researchers have previously shown that more than 70% of plain resveratrol is absorbed in the digestive tract. So any increase in absorption brought about by pterostilbene would only improve absorption by a marginal amount. For example, if pterostilbene improves oral absorption from let’s say 70% to 85%, then 115-125 milligrams of plain resveratrol would equal 100 milligrams of pterostilbene, absorption-wise. Pterostilbene is lipophilic, that is, it dissolves in fats and oils better than in water. Since the lining of the intestinal tract is composed of tightly-packed lipids (fats) and proteins, lipophilic molecules like pterostilbene penetrate this barrier better. But this doesn’t mean plain resveratrol is not well absorbed. It is a small molecule (228 Daltons molecular weight) and is readily absorbed. Some makers of resveratrol pills have micronized their products (reduced the average diameter of a solid material’s particles) and folded resveratrol into plant starches or dextrins (microencapsulation) to improve absorption. So methylation is not the only way to improve absorption. Methylated resveratrol makes more passes through the liver before it is attached or complexed with sulfate and glucuronate, making it more immediately bioavailable. This can also be accomplished by delivering quercetin, another red wine molecule, with resveratrol. The problem is that resveratrol has a relatively short half-life, ~1-3 hours, circulating the body on its own, as a free unbound molecule. Methylated resveratrol is said to have a longer half life. However, as resveratrol naturally attaches to glucuronate, this will extend its half-life to ~9 hours. So nature does for resveratrol what pterostilbene is advertised to do. 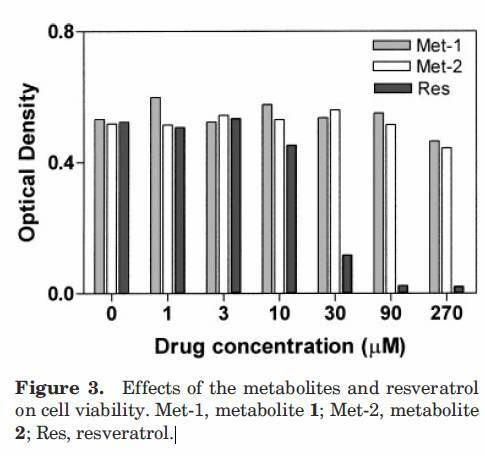 Whether methylated or glucuronidated or sulfated, resveratrol must become a free, unbound molecule to pass through cells walls and exert influence over intracellular genetic machinery. This is demonstrated in the following chart. The above chart shows various concentrations of resveratrol, MET-1 and MET-2 being resveratrol plus liver metabolites (glucuronate or sulfate) and RES as unbound, free resveratrol. The height of the bars indicates viral-infected cell viability. Only at higher concentrations and in its unbound form did resveratrol demonstrate an ability to kill viruses (cytotoxic) in combination with an antiviral drug. Nature takes care of the problem of bioavailability by producing glucuronidase enzyme, which is 16-times more abundant at sites of inflammation, infection and malignancy, which in turn unzips or releases resveratrol from glucuronate, therefore facilitating the delivery of resveratrol at the right time and place. The same holds true for resveratrol when has been conjugated (attached) to sulfate in the liver. Sulfatase enzyme activity unlocks resveratrol from sulfate, making it bioavailable. This is nature’s drug delivery system. Some drug molecules are pre-glucuronidated to facilitate delivery. So it is a mistaken idea that resveratrol, once metabolized in the liver, is not bioavailable. Most certainly, resveratrol by itself has been documented to produce a profound biological effect throughout the body – brain, eyes, heart, liver, kidneys – not just in the digestive tract where it is deposited via oral intake. Just why it has been said that resveratrol is not bioavailable is inexplicable. Pterostilbene is attempting to solve an imagined problem. Researchers are creating science to fit their own commercial interests.